A member of my PLN and #comcon, Aviva Dunsiger, recently posted the above comment on one of my blog posts. Aviva is great at pushing me to think. She always makes sure to comment thoughtfully and ask questions to encourage further thought. I am also thinking a lot about my rationale behind using educational technology because of discussions that took place between my BEd students yesterday in our first class. As a whole, my students were less familiar with edtech than I expected. Some even questioned the need for it. We are responsible for preparing our students for the future. As teachers, we have to be futurists. The future includes technology in our daily lives. For better or for worse, kids in today's classrooms will be using technology every day throughout their lives. If we don't help to prepare them to be responsible digital citizens and how to use technology effectively, who will? As those of you who know me in person know, I love technology. I love playing with new things and finding ways to make them help my students. I've gotten a reputation amongst peers and students that I am a "tech expert". I am not an expert by any means, but I am an eager learner. Using tech with students has been transformative for me (and for them). Students who struggled to find and share their voices in a busy classroom suddenly feel empowered through the use of tech. Some ways I've seen this is in the work they create on the Google Drive, the videos they create to share in class (sometimes if they're too shy to present in person), and the projects they collaborate on. Notice that in the previous sentence, I mentioned "creation" twice. It is too easy to be a consumer in our world. Creation is key in life and in education. It's part of the reason I'm committed to blogging more this year. We are all responsible to control our own impact on the world - in person and online. The sooner students start living this the better. Of course, there is a need for balance, and I don't, by any means, suggest that technology is a replacement for relationships or in-person contact. I only know that it enhances everything I value in a classroom. Tech helps with differentiation, creation, collaboration, authenticity, transparency, communication and engagement. My Rainbow Eggheads presented at a conference for local teachers last year about how tech enhances their learning. They can tell you far better than I can about the impact edtech has on them. I think today's teacher is not just a "Guide on the Side", but should be seen as a "Collaborative Curator". Technology gives me the abilities to: personalize all student learning and collaborate with each of my students; aid them in collaborating and connecting with each other and those in the world who can help and support them; help them sort through the huge volume of information available and curate effectively; give each student the opportunity to share his or her voice with each other and the world. 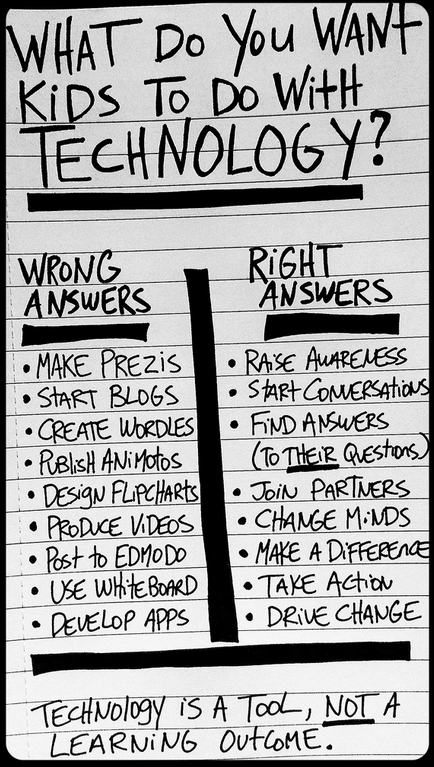 Technology, as Bill Ferriter wrote, is a tool, not a learning outcome. Like any educational tool, it can be used in a variety of ways depending on the creativity of students and teachers, and it does not stand alone. I share this image frequently. I think Bill effectively summarizes so much about what great educators do, in the face of fears of technology. Technology allows me, as a teacher, to bring my practice and student learning to another level. 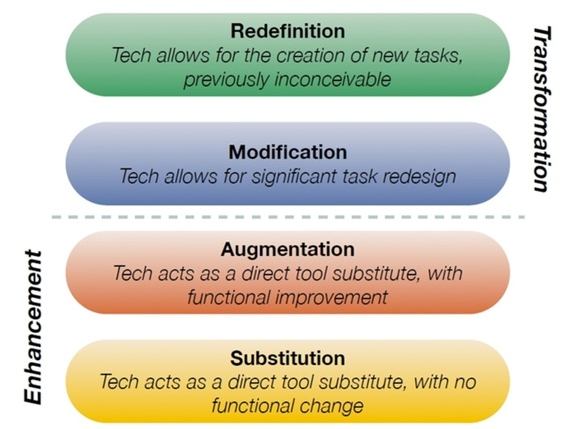 I have deeply internalized the SAMR model to not just enhance, but to transform my teaching. Just substituting a paper worksheet for one online does not an educational enhancement make. When you start to redefine teaching entirely, that is when technology becomes indispensable. Providing my students with opportunities to Skype and collaborate with students in California, create a video for a student in hospital undergoing cancer treatment, bring their families from around the world "into" the room by live streaming class events and sharing our inquiries with changemakers through Twitter and our blog would not be possible without technology. I think every teacher NEEDS to know and understand the SAMR model. My class learned and lived it last year. Becoming literate today means a lot more than being able to speak, read and write. As I shared with my BEd class yesterday, there are "New Literacies" illustrated by Silvia Tolisano that was can use technology to help our students develop. 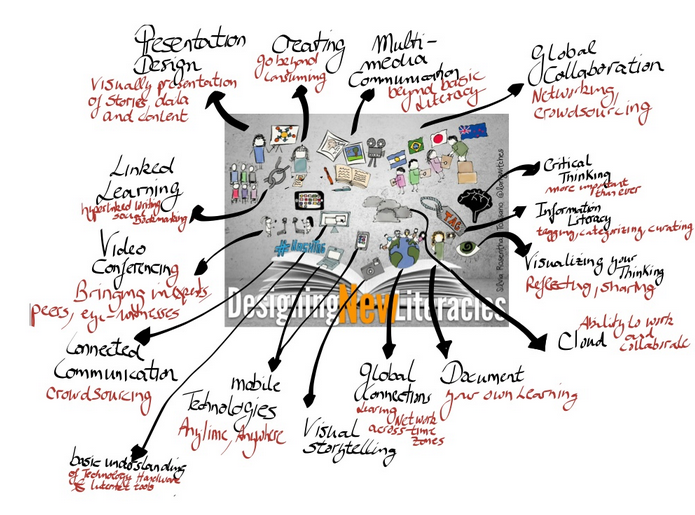 "New Literacies" include the abilities to collaborate globally, create multimedia and design effectively. My new grade 3/4 EPCOTclass is very excited to get started using their Chromebooks. We are several days and some training away from starting to use them daily, but I look forward to exploring with them the challenges and advantages of having access to technology anywhere, anytime in our classroom. Teachers, we have to keep up with our students and help them keep up with the world. Technology is a tool that can help us do just that. Thanks for sharing the thinking behind your technology choices! You make some important points. I can't help but think though about the importance of curriculum expectations: how do you keep the focus on curriculum? What about students and/or parents that would prefer low-tech options? How do you address this need? Like you, I love technology. I always have an iPad with me, but rarely have a pen. I would always choose to type over write. But I wonder if all students feel this way, and if I believe strongly in the use of voice and choice in the classroom, does having everyone work on a device, provide students with this? Does this matter? I've been thinking a lot about this recently, and I'd certainly welcome any further thoughts you have on this. Thanks for the great discussion! Great questions. I don't think I'll ever get to bed tonight between your blog, twitter and my own blog! Tech is just a tool and I have no trouble addressing curriculum expectations using technology. Just like any other task, edtech tasks can be designed to incorporate technology to meet expectations. For the most part, students and parents are enthusiastic about tech use. I always have questions, but the longer I've worked with tech with students, the more examples I have to point the parents towards to see the value in using tech in the classroom. I do not expect students to access tech at home. In terms of choice, once they are trained on a particular technology (three class iPads, iPhone, Chromebooks, desktop, maker tools), students always have the option to share their learning in any manner. They can use pen and paper, hands on tools or tech tools. I encourage students who always gravitate towards one mode to try others as well. The device itself provides a lot of choice. Think of apps on the iPad like Puppet Pals, iMovie, Explain Everything and Twitter or Vine. Even if several students were working on iPads, their creation could be completely different. Again, it's so important to reflect on my practice and to seek balance. Tech tools provide another level of choice for students and I've seen many of them feel incredibly empowered. Another great advantage is the way that students can teach their peers and staff with what they have learned using edtech - both their academic curricular work and their 21st century skills. Thanks for the reply, Shauna! Hearing more about how you actually use the technology tells a lot. I wonder about the paper option. Do you model this use? How often do students choose this option? For what subject areas? Do you see any correlation between modelling use and the actual use of the tool? I ask because a similar conversation came up in previous years for me (when it came to cursive writing in the classroom), and modelling its use made a big difference in how frequently it was actually used. I just wondered if the same was true here. And with that, it's time for bed! :) Lots of great "talks" tonight! You lasted longer than I did last night! I model paper use and tech use, but even more powerful, I have students model their uses and offer options to their classmates. I'm sure, like your use of cursive, the samples that are modelled result in more students trying those options. I strive to provide lots of options on equal footing for each activity, but because of my love of tech, I'm sure that comes through to students. Have a great Friday with your grade 1s! Thanks Shauna! I love that you model everything and that you get your students to as well. I have no doubt that this helps students see the value in so many different choices. Have a great Friday too! For better or for worse, kids in today's classrooms will be using technology every day throughout their lives. Here's a bit of fun pushback, Shauna: I'd argue that kids in today's classrooms will be critically thinking every day throughout their lives. They'll be trying to solve complicated problems every day throughout their lives. They'll be asking challenging questions every day throughout their lives. Let's teach them how to do those things well. And let's show them how technology can be used to make that work easier. When I'm thinking about technology, I have to constantly remind myself that what we can do with technology should stand at the center of my thinking -- not the tools themselves. It's linguistic jujitsu, but I try to stay disciplined about it so that I always keep tech in its proper place. I absolutely agree with you, Bill! It's like when I teach students how to "blog." I don't talk about using the computer or iPads, or even about blogging. I tell students that we're going to work on "expanding ideas in our writing," or "focusing on conventions in our writing," or even "editing our writing," and that a blog is how we're going to focus on this. Students then start to see the tech as a tool, but start to really understand the curriculum expectations. You can do the same thing with critical thinking. Tell students that we're working on solving problems, inquiring, and/or asking or answering difficult questions. Then show them the tools that they can use to do so. The change is small, but I think that the impact is huge. I'd be curious to know what others think! As always, you've said things in a clearer and more thoughtful way than I! Your comment totally makes sense and gives me another, deeper way to look at the use of technology in the classroom. I am a huge fan of linguistic jujitsu and appreciate your comment and insight.